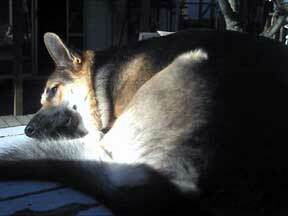 I have a 5 years old female GSD (RoseBlue) who will be spayed next week. What is the recover time for an older dog? She is in good health. Our home is quiet and we have no human kids. We do have 2 of her male puppies, which we will keep separated. Any bits of personal experiences would be appreciated. Since she is older, I am researching all I can. For a procedure like this I'd advise you to keep her as quiet as possible for at least 3 - 5 days. She's going to be really sore and bruised so give her plenty of quiet time, supervise outdoor walks carefully and keep a close eye on the incision area - you want to keep this as clean as possible. After that time you can increase her back to a normal schedule - slowly - over the course of another week or so - but watch her carefully for any indication that she's in pain or that her recovery schedule needs to be a bit slower or faster - she'll let you know. Once the incision completely heals you should have no big problems.